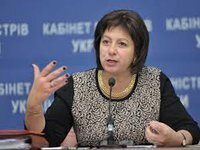 The Cabinet of Ministers of Ukraine has found sources to cut expenses in the draft 2016 budget, Finance Minister of Ukraine Natalie Jaresko has said. "After analyzing all budget items jointly with the prime-minister and president we've found a possibility of cutting expenses by over UAH 60 billion compared to the basic draft budget, but we would require broad support of lawmakers and the public to put it into action," Jaresko wrote in an op-ed article in the Ukrainska Pravda publication. Jaresko said that the government cannot reduce social expenses, and the only way to achieve the decrease in expenses in this area is to increase their efficiency via verification, targeting and providing aid only to those who really needs it. The finance ministry said that in the economic area (construction of roads, agriculture and energy) the government is revising the structure of expenses and wants to considerably increase its efficiency. Jaresko said that in the healthcare the reserve for saving is the switch to the financing of medical services, not beds and hospitals. "We also should considerably reduce the government staff," she said, adding that it is impossible to save many funds in this area. She said that the government does not plan to reduce expenses on defense. "We plan to increase expenses on defense by more UAH 10 billion in live money compared to 2015 under the decisions made by the NSDC [National Security and Defense Council of Ukraine]," she wrote. Jaresko said that next week the government will submit the draft 2016 budget to the parliament, as well as draft tax reform and some legal acts to reform different government expenses where the government would propose cutting them via optimization and concentration of public resources.